Mitochondria are dynamic organelles that require a controlled balance of essential ions to perform critical functions within cells. The content of these elements can both influence the effect of and be influenced by different stressors, including aging (Klang et al., 2014) and exposure to toxic chemicals (Sahu et al., 2013). 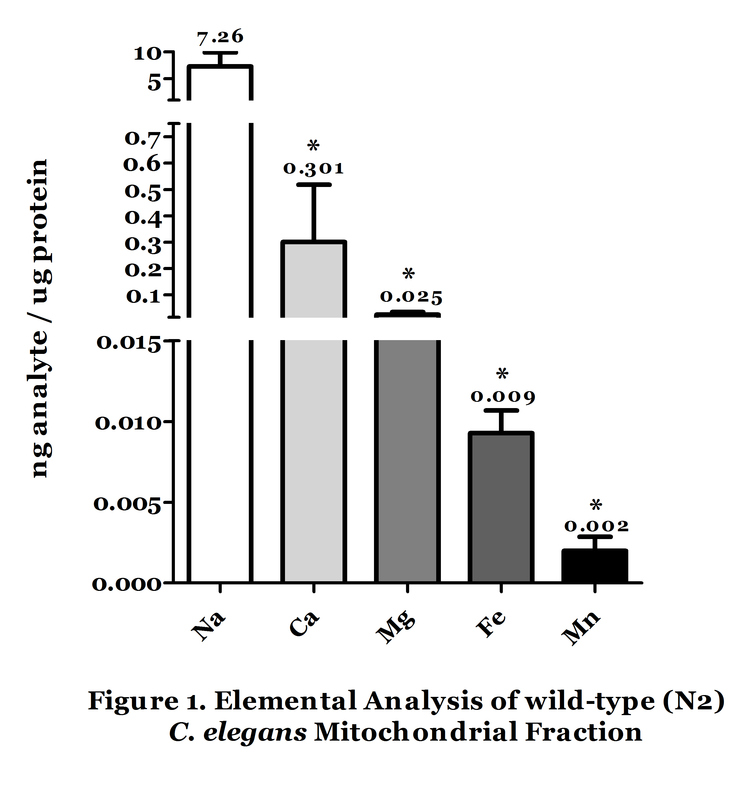 This article provides reference concentrations of five essential ions present in the mitochondrial fraction of young adult N2 C. elegans. Briefly, 50,000 N2s were grown to young adult stage for mitochondrial isolation. Mitochondria were isolated from whole nematodes by dounce homogenization and differential centrifugation into a crude mitochondrial fraction as described (Kayser et al., 2004) with minor modifications. Elemental analysis of mitochondrial fractions was performed by inductively coupled plasma mass spectrometry (ICP-MS). Samples were prepared by oven drying (95°C overnight) and HNO3 digestion (90°C for 4 h), followed by dilution with MilliQ water to a final HNO3 concentration of 3% prior to elemental analysis by ICP-MS. Results were normalized to protein content (BCA assay). Sodium (Na) was present in the highest concentrations compared to other elements (significantly higher than calcium (Ca), magnesium (Mg), iron (Fe), and manganese (Mn); One-way ANOVA with Tukey’s post-hoc test, *p≤0.05; means are denoted above each bar). Mitochondrial Na concentrations are significantly higher than Ca concentrations in mammalian cells (Murphy and Eisner, 2009), and mitochondria can be a sink for magnesium (Kubota et al., 2005) as well as iron in mammals. It should be noted, however, that measured mitochondrial ion concentrations are influenced greatly by the method used for isolation; caution should be exercised when interpreting relative ion concentrations. These data serve as reference concentrations for mitochondria isolated from young adult N2 utilizing the cited methods. Kayser, E.B., Morgan, P.G., and Sedensky, M.M. (2004). Mitochondrial complex I function affects halothane sensitivity in Caenorhabditis elegans. Anesthesiology 101, 365-372. Klang, I.M., Schilling, B., Sorensen, D.J., Sahu, A.K., Kapahi, P., Andersen, J.K., Swoboda, P., Killilea, D.W., Gibson, B.W., and Lithgow, G.J. (2014). Iron promotes protein insolubility and aging in C. elegans. Aging (Albany NY) 6, 975-991. Kubota, T., Shindo, Y., Tokuno, K., Komatsu, H., Ogawa, H., Kudo, S., Kitamura, Y., Suzuki, K., and Oka, K. (2005). Mitochondria are intracellular magnesium stores: investigation by simultaneous fluorescent imagings in PC12 cells. Biochim Biophys Acta 1744, 19-28. Murphy, E., and Eisner, D.A. (2009). Regulation of intracellular and mitochondrial sodium in health and disease. Circ Res 104, 292-303. Sahu, S.N., Lewis, J., Patel, I., Bozdag, S., Lee, J.H., Sprando, R., and Cinar, H.N. (2013). Genomic analysis of stress response against arsenic in Caenorhabditis elegans. PLoS One 8, e66431.